Dave Elger on Running, Racing and Training: How High Do You Run? How High Do You Run? MY COMMENT: Practice running with a shorter stride to decrease vertical bounce. If you run with a shorter stride, you take more strides, and your total vertical distance will be even greater. 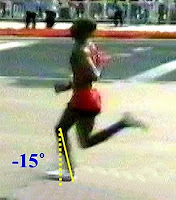 Wanjiru had a much longer stride than the Americans, but less vertical displacement. Stride length and vertical displacement are two separate entities. Bounce is mainly a flexibility problem. The stiffer you are, the more you will bounce up and down. And you will also have a short stride.